Davis was the youngest of the ten children of Samuel Emory Davis (Philadelphia, Philadelphia County, Pennsylvania, 1756 – July 4, 1824) and wife (married 1783) Jane Cook (Christian County, (later Todd County), Kentucky, 1759 – October 3, 1845), daughter of William Cook and wife Sarah Simpson, daughter of Samuel Simpson (1706 – 1791) and wife Hannah (b. 1710). The younger Davis' grandfather Evan Davis (Cardiff, County Glamorgan, 1729 – 1758) emigrated from Wales and had once lived in Virginia and Maryland, marrying Lydia Emory. His father, along with his uncles, had served in the Continental Army during the American Revolutionary War; he fought with the Georgia cavalry and fought in the Siege of Savannah as an infantry officer. Also, three of his older brothers served during the War of 1812. Two of them served under Andrew Jackson and received commendation for bravery in the Battle of New Orleans. 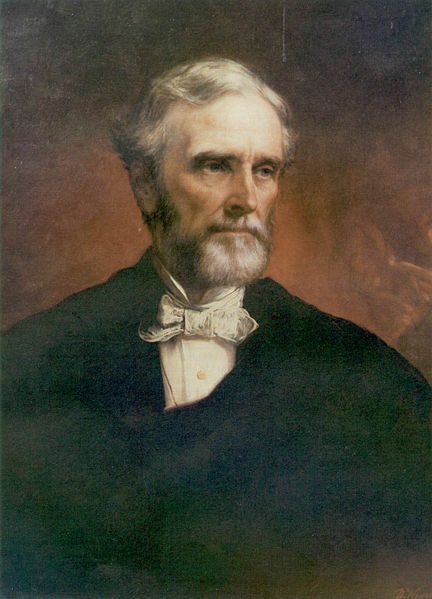 DAVIS, Jefferson, statesman, born in that part of Christian County, Kentucky, which now forms Todd County, 3 June, 1808. His father, Samuel Davis, had served in the Georgia cavalry during the Revolution, and, when Jefferson was an infant, removed with his family to a place near Woodville, Wilkinson County, Miss.